Kansas remains in a perpetual budget crisis as another legislative session begins. Lawmakers have already approved budgets for FY 2016 and for FY 2017, but both must be adjusted just to keep the general fund solvent. Is it possible to get through FY 2016 without further cuts? A very high risk exists for further mid-fiscal year program cuts. In November, the state’s revenue estimators markedly lowered expectations for the amount of tax revenue that Kansas would receive in FY 2016. The new estimate put the general fund underwater by more than $100 million, even though lawmakers had hiked the state sales tax rate in June and directly transferred more than $200 million from other state funds. 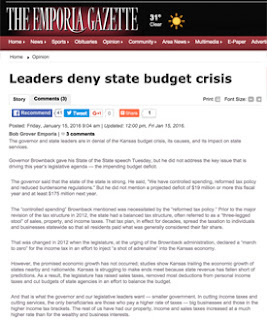 In response, the Brownback administration took emergency action in November to take yet another $50 million from the highway fund and $9 million from early childhood accounts, and imposed deeper spending cuts on programs. These actions just inched the general fund balance above zero by a few million dollars. If actual tax collections do not meet the lowered targets, further budget cuts will be required. Kansas does not have any reserves left to deal with further revenue erosion. Even with lowered expectations, the new estimate predicts that tax collections will increase by 5.7 percent in FY 2016 . However, through the first 6 months of FY 2016, actual collections have grown less than 2 percent from the previous year. The revenue estimators likely still have the revenue estimate set too high. What must be done to the existing FY 2017 budget — at minimum? At least $175 million must either be added to revenue or subtracted from approved expenses to stay solvent. That’s the bare minimum required to keep the ending balance above zero, and would only eke the state through to the next year. 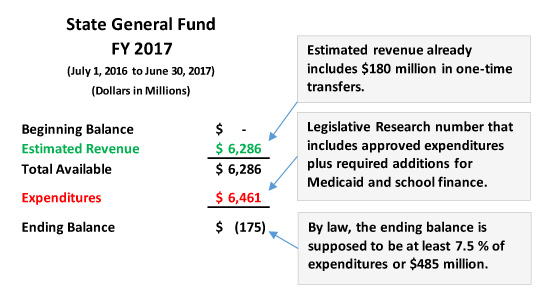 Keep in mind that the revenue estimate for FY 2017 already includes $180 million in one-time transfers from other funds. Doing the bare minimum does not account for any action that may be required from the school finance court case, does not provide any ending balance, and does not deal with understaffed prisons and hospitals. And if the revenue estimate for FY 2016 is still too high, the one for FY 2017 likely is, as well. To be financially stable, Kansas must adequately fund key programs, have a balance between income and expenses, and keep a reasonable amount of reserves. Not even one of those three things is occurring now. The problem rests with unaffordable income tax cuts that dramatically diminished the state’s revenue stream and produced a perpetual budget crisis. Fixing the problem requires revisiting those income tax policies and correcting them.